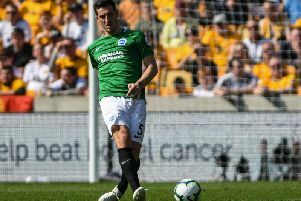 With question marks still over the omission of Lewis Dunk from the England squad, manager Gareth Southgate has stressed the players he has picked 'are ahead of those' he hasn't. While Brighton & Hove Albion's centre-back was not mentioned by name, the Three Lions boss made it clear that he was aware all the English players available to him and has picked the who he believes are the best. That was when speaking in his World Cup squad announcement press conference today. Stand-out defender Dunk played every single minute of every game for the Seagulls as they achieved Premier League safety last season. Plenty of Albion fans, pundits and his team-mates were hopeful the 26-year-old would have had a call-up by Southgate in March for England's friendly matches against Holland and Italy. But having been overlooked at the expense of uncapped duo James Tarkowski and Alfie Mawson, it was clear he was not yet in the England manager's plans. It was therefor no big surprise that when the 23-man squad for Russia was announced on Wednesday, Dunk did not appear. And while not being asked directly about Dunk, Southgate did field questions on the omitted Adam Lallana, Joe Hart, Jack Wilshere, Jonjo Shelvey and Ryan Sessegnon, and stuck by his selection. He said: "I do not know how many hundreds of games myself and Steve Hollands have watched this year, but it would be a lot live and even more downloaded back in the coaching room and at home. "We know all of the English players in the league and know their strengths and weaknesses and we think the players we have picked are ahead of those we have not." And while talking about goalkeepers, he explained his selections have been purely on form, adding: "They are the best three English goalkeepers we have in the league. We are not picking young players or inexperienced players because they are young and we are trying to bring them on. "We are picking young players because we beleived they are the best in their position for the way we want to play and the style we want to play."